The deal is done. From left, Thor Björgólfsson, Novator Partners founder, Liv Bergþórsdóttir, Nova CEO, and Hugh S. Short, founder and chairman of the Anchorage-based Pt. Capital. “Our investment is potentially the largest in Iceland since the 2009 crash,” said Pt Capital Advisors founder and CEO Hugh Short in an interview with the Journal. 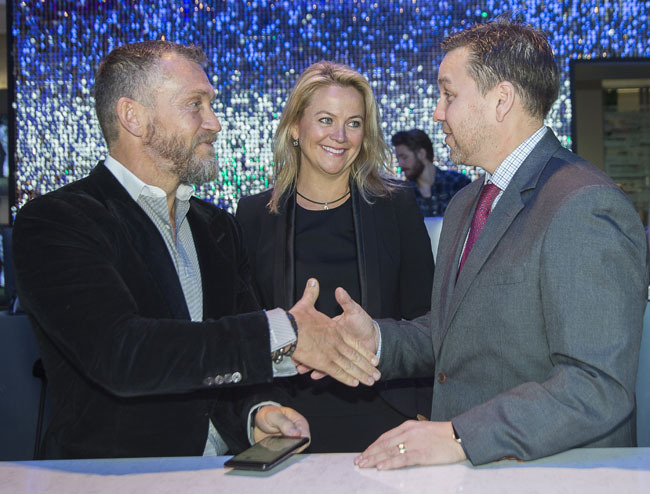 The Anchorage-based private equity firm has just announced it will acquire the leading mobile provider in Iceland: Nova. Subject to notice, the final sale price is not being disclosed. Local press in Iceland values the sale at 15 billion krona, which equates to about $130 million U.S. dollars. A finalized deal is expected within the next few months. According to the World Bank, Iceland’s GDP in 2015 was just more than $16 billion. Although it represents only a fraction of the world’s economy, Iceland’s GDP is growing faster than the U.S. Given the current uncertainty and challenges in the state’s economy, Short said, it seemed prudent to look to other areas. Iceland, he noted, was at the top of the list. Feeling bullish about future growth in the area, Short said the significant investment should be a point of pride for Alaska. “There is a lot of experience our team brings in the telecommunications business here that will help grow the company,” he said. While Short would not speculate on other developments in Iceland, investing in telecom is investing in infrastructure, and is usually a leading indicator that economic development is about to take place in a region. In terms of Iceland, that may mean a staging ground for future growth in the Arctic, including increased shipping lanes or natural energy to be found, but this is not confirmed. Now in its fourth year of operations, Pt Capital Advisors is a subsidiary of Pt Capital. Focusing on opportunities in Alaska, Canada and Greenland, this is the firm’s first investment in Iceland. Stephanie Prokop can be reached at [email protected].